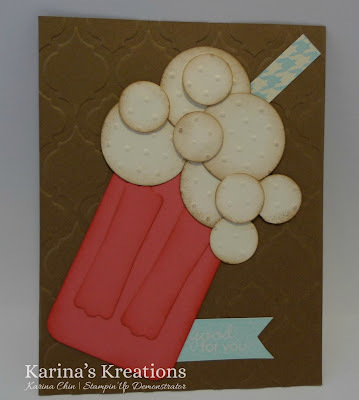 Karina's Kreations: Stampin'Up Milk Shake Card! Convention starts tonight at 5:00!!! Woohoo!!! I'm going to start lining up at 4:00 so I hope to swap these cute milkshakes cards in the line up!! One of the fun things about convention are all the amazing swap cards you get! I made 130 swaps and had Melissa make these ones for me. -#129714 Banner Greetings Hostess stamp set. I hope you love the card!!! P.S. You're invited to my Convention 101 class on July 26th!! !